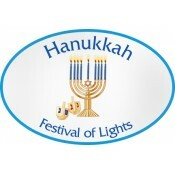 Do you wish to light up your brand promotion during the Hanukkah/Chanukah? 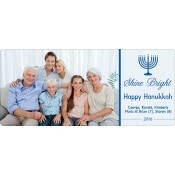 Feel free to indulge with customized Hanukkah magnets, specially designed to celebrate fervor of the season. These religious holiday magnets are gaining popularity with the masses because they are adorable and extremely affordable. 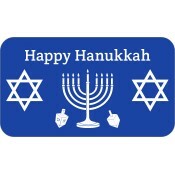 Customized magnets with Hanukkah symbols are perfect for sending out holiday invites, wishing dear ones/clients on the festival, expressing the joy of various individual celebrations ( winter baby shower, winter wedding) and pushing Hanukkah special/holiday sales. 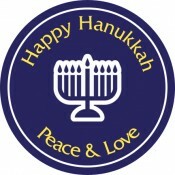 Hanukkah is also known as Chanukkah or Chanukah and it is a popular Jewish holiday. It is also popularly referred as the Festival of Lights and is observed for eight nights, starting from the 25th day of Kieslev, following the Hebrew Calendar. Nine-branched candelabrum, known as Menorah is the brilliant symbol of this holiday and it is lit in progression from day one to the day eight. If you wish to promote your business without disturbing your budget or sanctity of the festival, feel free to order these promotional Hanukkah refrigerator magnets. All our personalized magnets including these holiday magnets are made in USA and they respect the American labor traditions. We offer a thoughtful collection of these customized seasonal magnets crafted over various popular sizes of rectangle and square magnets. We would say sky is not an end, when it comes to personalizing any of our custom magnets for Hanukkah gifting. Advertisers who wish to remain loyal with the spirit of festival can approach us with their needs and we can help them with various other Jewish religious symbol magnets, custom shaped magnets, oval magnets, circle magnets, etc. Earlier gifting was not an important aspect of Hanukkah celebration; however, in the recent years, this trend has gathered momentum. People are splurging on gold coins, chocolate coins, dreidel, and traditional food gifts. However, most of these gifts are highly in demand during the season, but their importance is peripheral and they are not remembered, until the next holiday season. You can easily get over this gifting fiasco by distributing these full-color Hanukkah fridge magnets. People would be happier to retain them over their plain refrigerator doors. 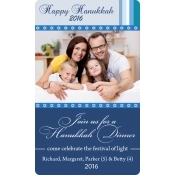 We offer highest wholesale savings on bulk orders of these customized Hanukkah magnets, which means marketers, can easily slice down their marketing investments. Being attractively priced, marketers can easily avail these personalized magnets for gifting during religious events, holiday celebrations, and trade shows or even consider it for bulk mailing. Additionally, we offer free art setup, free online design proof, free shipping, and free full-color printing on all our orders. To know more about these promotional seasonal magnets, feel free to converse with us by calling at 855-762-4638 or write to us at info@cmagnets.com.